Four Seasons No list of beach bars would be complete without a destination in Hawaii. The Beach Tree Bar at the Four season in Kailua Kona, Hawaii is one of the best out there. The bar offers an amazing selection of libations, and a view of the sunset that can’t be beat. If you really want to get away when you drink, the Pelican Bar at Jake’s Hotel in Jamaica is just what the doctor ordered. Located a 20-minute boat ride from the hotel, this secluded bar is built on a sandbar in the middle of the sea, and offers the opportunity to knock back a few without any of the distractions of the mainland. 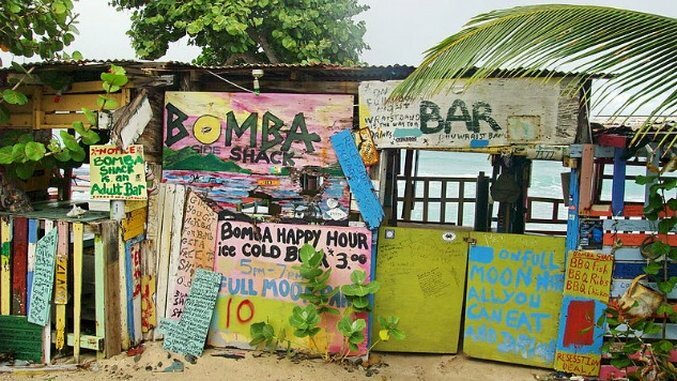 Wikimedia user Bgabel Bomba’s Surfside Shack n the British Virgin islands might not look like much, but the beachside bar is more than meets the eye. Opened in 1976, the bar is famous for its “Bomba Punch” and its full moon parties, an all-night shindig with all-you-can-eat barbecue and more. Hula Hula Hvar Hula Hula Hvar is a beachside bar in Havr, Croatia known for its chill beach scene during the day, and awesome party scene at night. Spend the afternoon lounging in one of the club’s oceanside deck chairs, and then stick around after dark for one of the best dance parties around. Ritz Carlton If you’re looking for a classier place to have a seaside drink, then the Ritz Carlton in Half Moon Bay, California is right up your alley. You don’t have to be a hotel guest to enjoy the outdoor patio, which includes several fire pits, high-end smores kits, and even a hot chocolate bar during colder weather. Margaritaville Hotel There’s a reason why Jimmy Buffet sang about Margaritaville. Even if you’re not a Buffet fan, you’ll love the Margaritaville Beach Hotel in Pensacola. The hotel sits right on the ocean, and has a beachside bar where you can sit by the fire, and even sometimes watch a movie. There’s nothing quite like sipping on the perfect drink while watching the waves crash on the beach. While unfortunately we can’t all enjoy beachside cocktails everyday, there are a number of amazing beach bars out there to make sure when we do get to drink on the beach, we’re doing it in style. Here are a handful of amazing seaside spots where we definitely wish we were drinking right now.